Between 26th May and 11th June 1942, a handful of Free French drawn from all over the French Empire resisted ferocious attacks by the Afrika Corps led by Rommel. 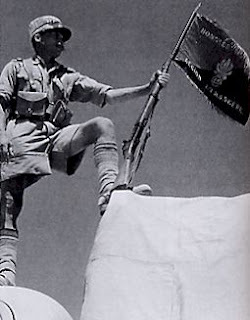 Their aim, to hold the fortified position of Bir Hakeim long enough to allow the defeated British Eighth Army to withdraw to the ridge at El Alamein, the very last defensive position before Egypt and the Suez Canal. For his part, Rommel tried to destroy the French defenders in order to allow his armoured divisions to sweep around to the North and cut off the fugitives’ escape route. Koenig did all that was asked of him, and more. The Eighth Army pulled back to El Alamein where it first repulsed Rommel’s attacks and then went over to the offensive, in the operation that would lead to the liberation of North Africa. If Koenig and his men had failed, if Rommel had captured virtually all of the retreating Eighth Army, the history of the Second World War could have taken a dramatic turn. Rommel the conqueror of Egypt, astride the Suez Canal, able to turn northward into Syria and Iraq to cut off the Allies’ oil supplies, and go on to attack the underbelly of the Soviet Union. Rommel continuing to the East, welcomed in Afghanistan as the new Alexander, Panzer Divisions debouching from the Khyber Pass, falling on the rear of British India while the Japanese pressed in from the East. These are uncomfortable scenarios, but Koenig’s Free French Brigade stopped Rommel in his tracks, and helped save the Free World from many more months of painful conflict, and perhaps a complete disaster.